Located approximately thirty miles northwest of Milwaukee between Highway 41 and the Pike Lake Unit of the Kettle Moraine State Forest, the WASHINGTON COUNTY Village of Slinger has blended agricultural production and heavy manufacturing with community engagement since the late 1840s. 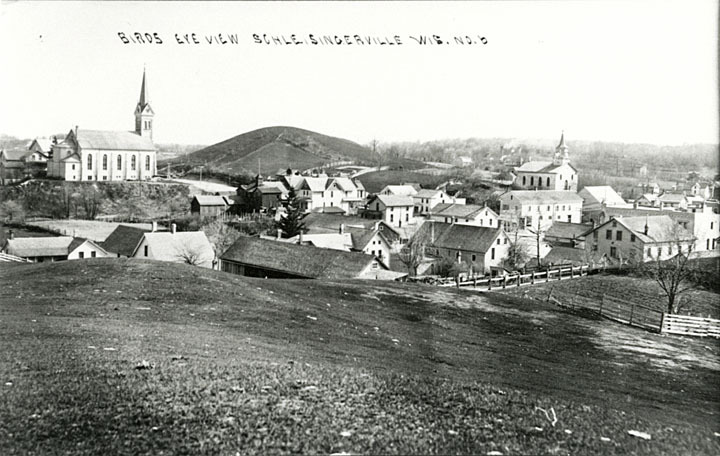 Officially incorporated as Schleisingerville in 1869, the village’s population rose slowly through its first century, housing 380 residents in 1875, 760 in 1930, and 1,612 in 1980. However, its populace tripled during a housing boom in the 1990s and surpassed 5,000 residents by 2010. For the sake of brevity, villagers approved shortening “Schleisingerville” to its commonly used nickname, “Slinger,” in 1921. Baruch Schleisinger Weil founded Schleisingerville in 1845 after buying several thousand acres of government-owned land in the TOWN OF POLK. Weil, an immigrant merchant and future state politician from France’s German Alsace region, used monies earmarked for purchasing horses for the French government to secure the plot. He soon built a home and general store, which served as a critical trade center for area woodsmen, farmers, and Native Americans. Schleisingerville opened its first Post Office in 1850 and, in 1855, obtained a stop on the La Crosse railroad line. This attracted a range of entrepreneurs, including merchants, bankers, hoteliers, tanners, and blacksmiths. Farming, retail, banking, and small-scale manufacturing dominated the village’s economy from the 1850s through the World War eras. Notable businesses included Roth’s Hotel, State Bank of Schleisingerville, Lehman Rosenheimer Farm Implements, Washington County Telephone Company, and Schuck & Frey’s general store. 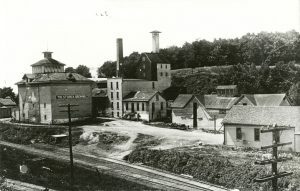 For more than eight decades after 1868, Slinger also housed a brewery. The Storck Brewery survived as an ice cream and bootleg beer maker during PROHIBITION and supplied the Milwaukee BRAVES during the city’s 1953 Brewery STRIKE. Following World War II, heavy manufacturers and sporting attractions served to recast Slinger’s rustic image. Maurice Holtan, founder of the Slinger Foundry Company (1944), patented and distributed the cast iron cylinder liners used by BRIGGS & STRATTON and HARLEY-DAVIDSON for their products’ engines. In addition, the Slinger Super Speedwaya professional AUTO-RACING track, continues to boost local revenues, drawing more than 100,000 spectators annually. Slinger’s predominantly middle- to- upper class residents belong to a variety of churches and voluntary associations. Early settlers founded the village’s most prominent houses of worship in the 1850s, including St. Paul’s Lutheran Church, St. Peter’s Catholic Church, and St. John’s United Evangelical Lutheran Church. Residents also participate in voluntary associations organized more recently, such as the Slinger Lions Club, Slinger Friends of the Library, and Slinger Advancement Association. In the late 20th century, Slinger’s rural identity began to shift. With its close proximity to major highways and a surplus of land available for development following an annexation drive, the village grew dramatically between 1970 and 2000. Such growth has led Slinger’s public officials to seek new methods of funding infrastructure and municipal services like sewer, water, and electricity in the 21st century, without raising property taxes on a growing number of high-value homes. Larry Gundrum and Dean Otte, “The Development of Slinger” in Slinger Advancement Association, Slinger Historical Album: Schleisingerville to Slinger, 125 years, 1869-1994 (Slinger: Slinger Advancement Association, 1994), 34. United States Census Bureau, “Slinger (village), Wisconsin,” State and County Quick Facts, accessed May 28, 2013. Local historians have speculated the name change resulted from anti-German hysteria during World War I.
 Scott Simon, “Baruch Schleisinger Weil,” in Slinger Advancement Association, Slinger Historical Album: Schleisingerville to Slinger, 125 years, 1869-1994 (Slinger: Slinger Advancement Association, 1994), 2. While serving in Wisconsin’s state legislature, Weil took a lead role in establishing the boundary between Washington and Ozaukee Counties. Slinger (Wisconsin) Centennial Committee, Schleisingerville to Slinger, 1869-1969: Historical Album and Centennial Program Book (Slinger: Slinger Advancement Association Centennial Committee, 1969), 2-3. Amy Rabideau Silvers, “Beer That Made Slinger Famous,” The Milwaukee Journal-Sentinel, Metro Edition, January 24, 1996, 4. Upon discovering Storck’s bootleg brew in 1926, federal agents destroyed 2,348 gallons of the company’s product. Eldon Knoche, “Holtan’s Innovation for Cylinders Still Used,” The Milwaukee Journal-Sentinel, April 19, 1995, 7B; “Slinger Manufacturing to Supply Liners to Briggs,” The Milwaukee Journal Sentinel, December 9, 1996, 5. Lauria Lynch-German, “Drivers, Start Your Engines! In Its 51st Year, Slinger Speedway Gently Adapts to Changing Times,” The Milwaukee Journal Sentinel, Metro Edition, April 24, 1998, 1. The Slinger Super Speedway was built on the site of a popular dirt racing track built in 1948. 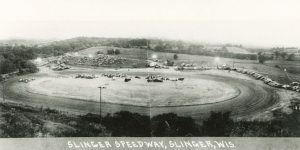 Slinger Super Speedway, “Slinger Super Speedway Track History—The Sunday Night Tradition,” accessed May 31, 2013. Schleisingerville to Slinger, 24-30. As of the 2010 census, 66.8% of Slinger’s population was of German descent. Peter Maller, “Slinger Expects Population Boom,” The Milwaukee Journal Sentinel, Metro Edition, August 15, 2003, 1B. Median home values rose from $125,100 to $197, 328 between 2000 and 2009; City-Data, “Slinger, Wisconsin,” accessed May 31, 2013; Peter Maller, “Slinger to Try Again to Add Housing Site,” The Milwaukee Journal Sentinel, Metro Edition, July 30, 2003, 5B. Slinger Advancement Association. 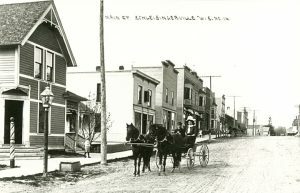 Slinger Historical Album: Schleisingerville to Slinger, 125 Years, 1869-1994. Slinger: Slinger Advancement Association, 1994. Slinger (Wisconsin) Centennial Committee. Schleisingerville to Slinger, 1869-1969: Historical Album and Centennial Program Book. Slinger: Slinger Advancement Association Centennial Committee, 1969.